In terms of supplies needed for your bullet journal, there are two main components: a writing utensil and something to write in. 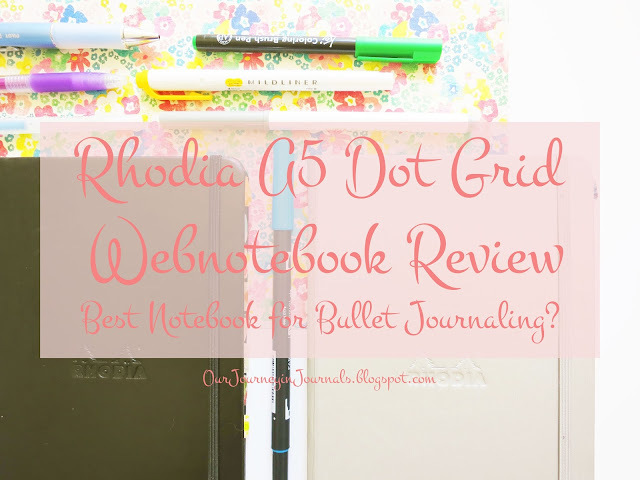 Today, I'll be reviewing something of the latter: the Rhodia A5 Dot Grid Webnotebook. This is the notebook I've been using as my bujo for almost an entire year (since August 2016), and I'm currently on my second one. If you are trying to find a good notebook for bullet journaling, then read on to discover if this will be a good choice for you! FTC disclosure: just FYI, some of the links here are Amazon affiliate links. That means that if you buy something through that link, I get a small commission at no extra cost to you. However, I do genuinely recommend these products, and my opinion has not been altered at all. Anyway, thank you for helping to support Our Journey in Journals!! First, let's start out with some basic specs. From Amazon, the Rhodia A5 Dot Grid Webnotebook is about $17 in USD depending on which color you get, and from Goulet Pens, it's $19.95. This is pretty average for "luxury" notebooks. I think it's only available in-stores in Europe, so as far as I know, you have to purchase it online if you live in the US (where I live)*. The dot grid is 5 mm (which is standard for grid notebooks in general). 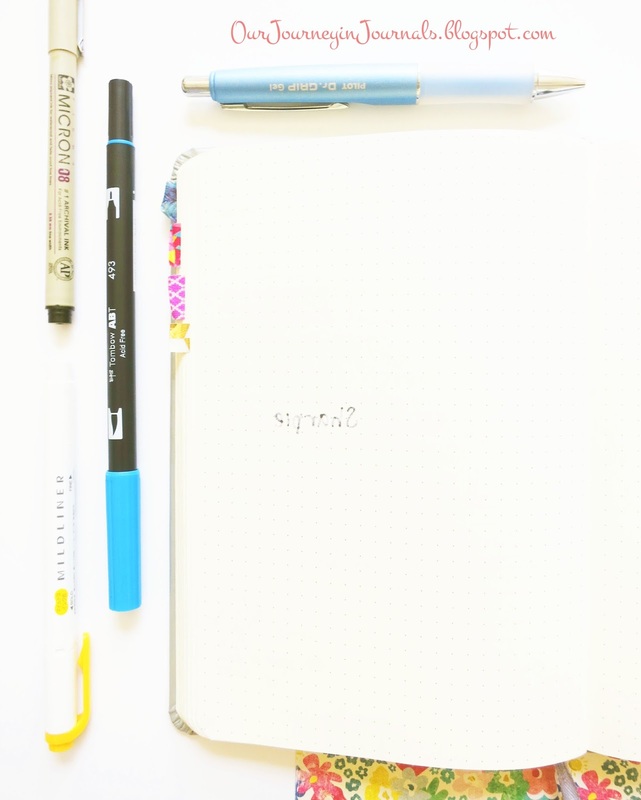 I like dot grid for bullet journals because it's easy to draw out neat spreads and write on a straight line, but it's unobtrusive enough to draw or do more free-form calligraphy. *Update: the only place in the US that I've seen sells Rhodia Webnotebooks in-stores is Fountain Pen Hospital in New York City. I've visited other shops that carry Rhodia products, but they still don't have Webnotebooks. 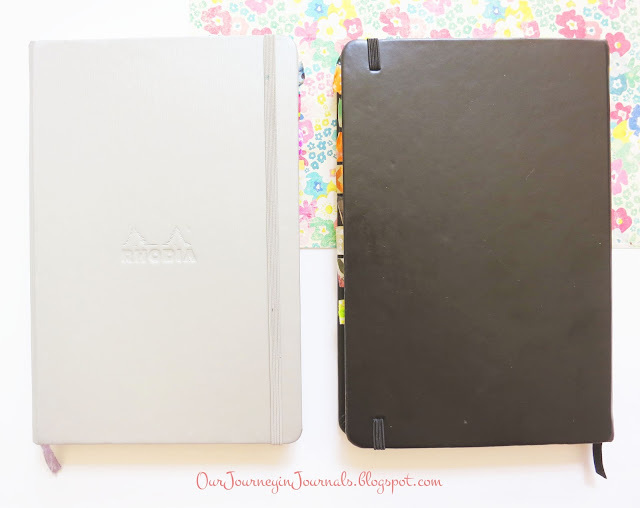 The A5 version is 5.51" x 8.27"/140 mm x 210 mm, which I think is the perfect size for bullet journaling; it's not so big that it's bulky and unwieldy to carry around, but it's not so small that it's hard to write a substantial amount of stuff on a single page. This particular notebook is 26 columns wide and 40 rows long. However, keep in mind that the dimensions of the A5 Rhodia Webnotebook are slightly smaller than standard A5, which is 150 mm x 214 mm. In terms of special features, it has a thick end-papers, a ribbon bookmark, an expandable pocket in the back, and an elastic that holds the journal closed; all of these things match the color of the notebook cover. The bookmark extends to about an inch below the bottom of the Webnotebook. The elastic is tight enough to stay put, but it isn't tight enough to put large indents into the covers or be difficult to take on and off. The Rhodia Webnotebook is hardcover (which I like so that I don't have to be at a table to write), and it comes in black, orange, and silver. I really wish there were more color options, especially since I despise orange; I've fully used a black one, and I'm about halfway through a silver one. I believe the orange version is identical to the black one (other than the color, of course). However, the main difference between the silver Webnotebook from the rest is that the cover has a brushed texture, and the other two are made of leatherette. Additionally, I've found that it seems to be of slightly worse quality than the black one; the spine is a lot more wrinkled and generally in worse shape (though I've used it for less time), and the ribbon bookmark is more frayed than the black one. Also, I don't think the silver one is available on Amazon. All three have the Rhodia logo debossed onto the front cover, which some may find annoying, but I literally don't care at all. The paper is where the Rhodia Webnotebook stands out. It's more off-white/ivory than I wish it was, since I personally prefer blinding, bright white paper, but it's not obnoxiously yellow. The paper is thick (90 GSM) and super smooth. It's just overall super awesome. Rhodia paper in general is known for being of really nice quality, and the Webnotebook is no exception. Sharpie still bleeds through to the other side of the page, but it doesn't bleed to the next one (I think I've only had one instance ever where it bled to the next page). However, brush pens, markers, highlighters, and fineliners, such as Tombow Dual Brush Pens, Crayola Super Tips, Zebra Mildliners, and Faber-Castell PITT Artist Pens, have zero bleed-through. There's also very minimal ghosting (where ink shows through on the back of the page), which is why I like the Rhodia Webnotebook more than Leuchtturm notebooks. Of course, with such smooth and non-porous paper, things do take longer to dry. It's not a super big deal (and it's an unavoidable trade-off with high quality paper), but just keep that in mind. It's most apparent when using fountain pen or if you want to use highlighter or marker on top of a gel pen or fineliner. However, it's not to the extent where marker or fineliner will generally smear. 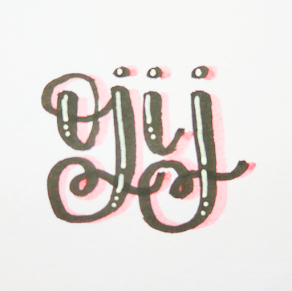 If you're a lefty (or just have a tendency to smudge ink) and like to use gel pen, then I suggest using the Pilot Juice 0.5 Gel Pen, since I don't have many problems with it smearing (even on the slow drying paper of my Webnotebook bullet journals). There are only three weaknesses of the paper for bullet journaling. First of all, the pages are not pre-numbered, but I don't think it's a big deal. Second, the very first page of the notebook has a bit of text at the bottom that talks about the paper. Again, since it's only on the first page, and the text is quite short and small, I don't think it's a big deal. The last drawback is something that I actually care about, though it might not actually apply to everyone. 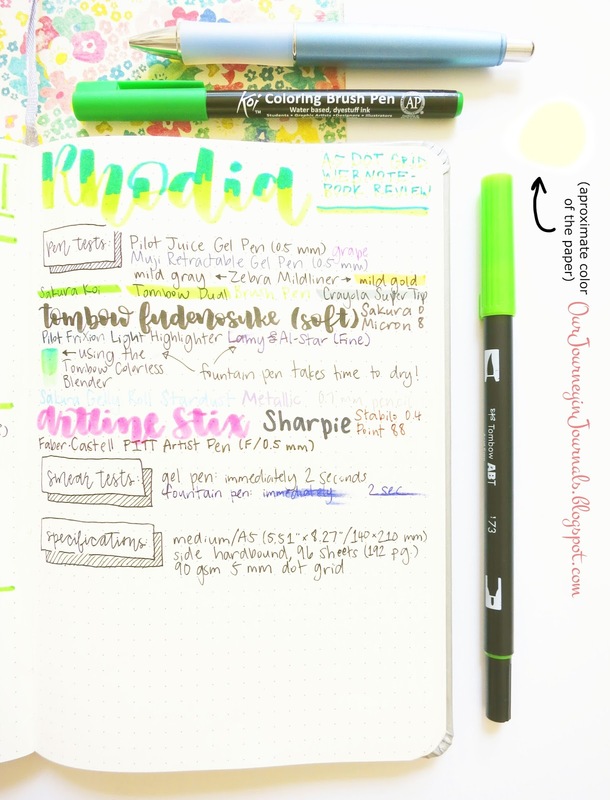 I recently tried blending brush markers in my bullet journal using the Tombow Dual Brush Pen Colorless Blender, and I've discovered that the paper does not take it well; it pills quite a bit. I think "pill" is the correct term, but in other words, little fibers in the paper ball up, so the paper gets a weird texture (kind of imagine spilling water on paper and then rubbing it back and forth with your finger). You can kind of see it in the above post from my Instagram. Honestly, this is really the only thing that I particularly don't like about the Rhodia Webnotebook. In summary, here are my main pros and cons for the Rhodia A5 Dot Grid Webnotebook. Each item is listed in order of most important to least important (at least to me personally). Overall, I would give the Rhodia Webnotebook (specifically A5 and dot grid one) a 9/10. 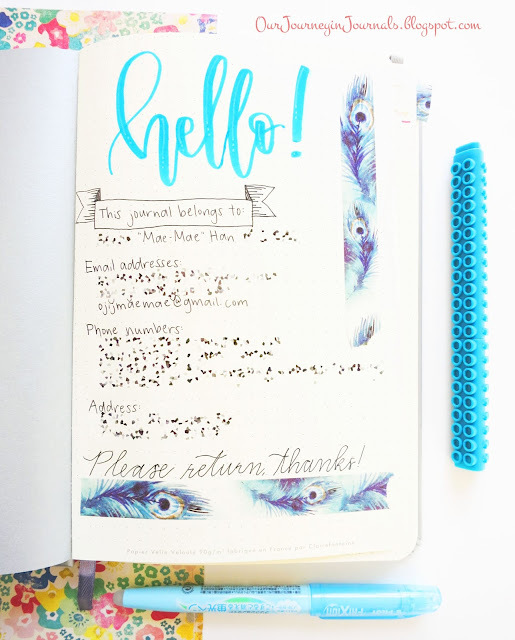 I recognize that there is room for improvement, but for me, this works really well as my bullet journal! After I'm done with my current one, I'm gonna try out a Scribbles That Matter notebook as my next bujo (just because I want to see how it is and there are a lot of different cover options), but it's not all too unlikely that I'm gonna gonna back to using a Rhodia Webnotebook. What's your favorite notebook for bullet journaling? Make sure to let the rest of us know by leaving a comment!